Complete guides to socialist feminism. 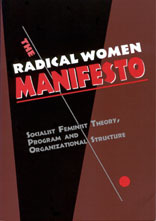 Current and classic feminist writings on race, gender, sexuality and class as viewed by Radical Women, a vibrantly activist socialist feminist organization. Pamphlets explore the dynamic feminism of women of color, women's leadership, multi-issue radical organizing, and the psychology of oppression - plus compelling feminist poetry. Which Road towards Women's Liberation:A Radical Vanguard or a Single-Issue Coalition? For additional socialist feminist writings, please visit www.RedLetterPress.org. The complete guide to Radical Women — a thriving activist, multiracial, queer and straight socialist feminist organization, founded in 1967 and still as subversive as ever! This updated edition of a women's liberation classic is an exhilarating exploration of Marxist feminist theory and activism. It is a unique and valuable resource — a handbook for feminist organizing, a history of Radical Women's impressive work, and a sourcebook of feminist thinking on a wide range of issues. An awesome anthology of essays and poetry about struggles of Asian American women to gain visibility against all odds. Read Nellie Wong's poem "Under Our Own Wings"
Un provocador análisis de los estereotipos utilizados para acosar a las lesbianas – extensiones de los que oprimen a todas las mujeres. Una guía esencial para todas aquellas personas que están luchando por erradicar el sexismo, el racismo y la opresión de clase. El Manifiesto es una estimulante exploración de ideas y una inigualable guía para el activismo. Los temas abarcan desde los orígenes de la opresión de las mujeres, a las intersecciones de raza y género, hasta una detallada plataforma para el cambio social. Aprende cómo la visión de un futuro feminista socialista es una meta apropiada para la sociedad global de hoy día.